You are currently browsing the tag archive for the ‘carnival’ tag. ‘Carnival Capers’ takes place at the beach and at a carnival. We watch Oswald and Honey trying to enjoy themselves, but being bullied by Peg Leg Pete. Oswald finally disposes of Pete, with help of a fence, a lobster, a cat, a dog and a goat. ‘Carnival Capers’ looks pretty old-fashioned by 1932 standards. It recalls the Mickey Mouse cartoon ‘The Karnival Kid‘ (1929) in its setting, and the silent Oswald cartoons with its love triangle. 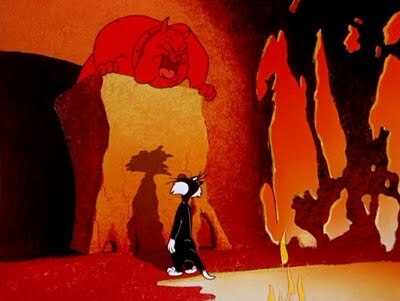 At one point Pete is cut into two – a familiar gag in the 1920s, but by 1932 a rare one, as by then cartoon characters had gained more consistency. Overall, the animation and the vocalizations are rather erratic. A young Tex Avery worked on this cartoon, and perhaps he came up with the gag of a phlegmatic dog making milkshakes with help of a shimmy dancer, which is arguably the best gag in the whole cartoon.